This was originally posted on Design Dazzle as a guest post! Thought you guys might like it! I love styling beautiful parties without breaking the bank. One of my favorite elements to use is tissue paper. It always amazes me how you can take a few sheets of flimsy, inexpensive paper and create something that is pretty and so memorable! I have been making tissue paper poms for a while,but I have been wanting to try to make a tissue tassel garland, so I thought I would share a tutorial so you guys to make one, too! 1. Open both sheets of tissue paper and align them together. You may need to iron your tissue if it has lots of creases. 2. Fold tissue in half across the width. 3. Fold again, but this time fold lengthwise. Position the tissue so that the folds are to the top and to the left. 4. You will cut the tissue a little less than 1/2 inch wide. Line your straight edge up and begin cutting about 2 inches down from the top. 5. Continue cutting across at 1/2 inch intervals. When you get to the end, cut all of the way up. You will then separate into two tassels. 6. Open one of the tassels all the way up with the cut portion on the sides. 7. Start at the bottom and fold the tissue up until you get to the top. 8. You will now twist the solid part in the middle. 9. Next you will twist it into a loop. Almost done! 10. Arrange all of your tassels in the order you would like to hang them in. 11. You will now open the loop and twist on to the rope. You will want to dab with glue as you twist to make sure it is secure. 12. Finish adding all of the tassels, brush them down a bit, and you are done! Isn’t it so vibrant and fun? These tissue tassel party garlands sell for a ton in online shops, but you can make one for yourself for just a few dollars! 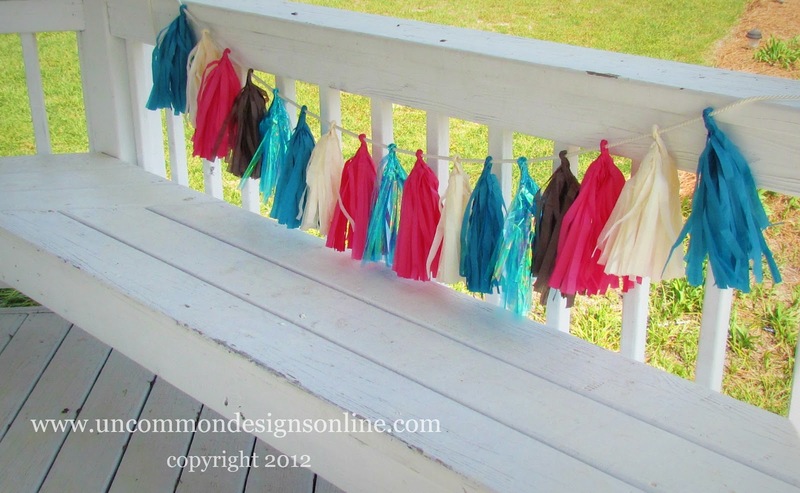 Need some pom poms to go along with the tissue tassel garland? Our tutorial on making party perfect tissue poms would be a perfect addition!! What other party decorations have you created on the cheap? That’s adorable Trish! I love cheap and easy party decorations too and this is definitely a keeper!Great tutorial too! I am pinning this for sure! I swear I find the BEST party ideas here. Thanks ladies! They look great – I’m Pinning too, thanks!! Well it looks like I will be copying this one! So stinkin’ Genius! Love this….posted it to FB! These are fabulous!!! Can’t wait to make them during our ‘birthday party season’! Great tutorial and blog! Visiting from the blog hop and am your newest follower. Hope you’ll stop by my blog, too. Hello Bonnie & Trish, I am now following via ‘Mingle With Us’. Great blog, lots of inspiration! Adorable! and it looks so easy, I’ll have to try them for our next party, thanks for the inspiration. I would love to invite you to join us and link up at our Friday Block Party at Curb Alert! The link is live now and throughout the weekend. Hope to see you there! Wow these tassels look fabulous!!!! How fun for a party!!!! I’ll have to try this sometime, it looks really cute! We always make these for the kid’s 4th of July Bike parade, but they make great decorations too.